A lovely red brick building with a stone slate roof, constructed in 1764 to replace an earlier chantry chapel on this site beside the River Douglas. The first church here was built in the 16th century, but it was later used as the private chapel of the Becconsall family. For those who are familiar with different styles of brock construction All Saints uses English garden wall bond. The church is built to a two-bay plan punctuated by a small sanctuary at the east end. There is no tower, just a west bellcote and entry is through a small west porch. The interior is very simple, with a wooden west gallery overlooking the nave. The gallery is supported on four slender posts and fronted by an attractively panelled front. There are only a pair of pews, but these and the wooden pulpit, altar, lectern, and panelling survive from the original Georgian construction. The church fell out of use when a new All Saints was built in 1926. An annual ceremony called "Old Church Sunday" has a procession through the village, ending at the Old Church, where participants offers prayers for mariners on the River Ribble. 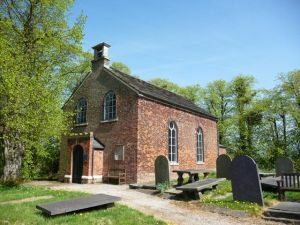 Becconsall Old Church is not in regular use and is cared for by the Churches Conservation Trust with the help of a local Friends group.